Miliband 'managed to pull everyone together' Jump to media player Caroline Flint says Labour is ahead in the polls and Ed Miliband is more in touch with the people on key issues. The challenges facing Ed Miliband Jump to media player The MP charged with running Labour's general election campaign on the challenges facing the party. Bird: Miliband wrong to give beggar money Jump to media player Big Issue founder John Bird says Ed Miliband was wrong to give money to a beggar on a Manchester street. Miliband: Time to care about our NHS Jump to media player Ed Miliband says it is time to transform the NHS as he announces plans for extra staff in the health service. MP reads missing bits of Miliband speech Jump to media player Angela Eagle delivers some of the parts of Ed Miliband's speech that he forgot to deliver to his conference. Miliband defends speech omission Jump to media player The Labour leader, Ed Miliband, has insisted the economy is "incredibly high" on his list of priorities after forgetting to include it in his conference speech. Is Ed Miliband up to the job of PM? Jump to media player Ed Miliband's personal ratings have been falling but there is little talk of changing him before polling day. Ed Miliband "managed to pull everyone together in a team approach" said his shadow energy and climate change secretary. 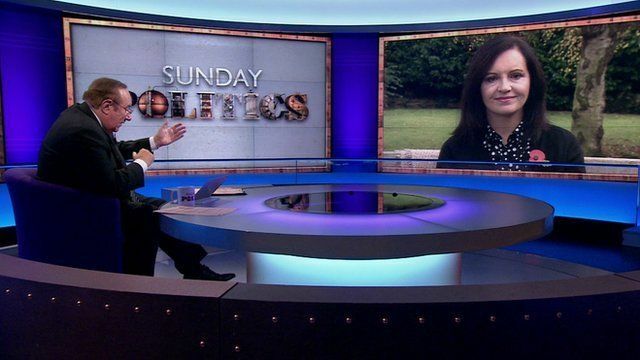 Caroline Flint spoke to Andrew Neil about rumours to remove Ed Miliband, and the polls about the party and the leader. Ms Flint, who backed David Miliband at the 2010 party leadership, said the party had been ahead in the polls and her leader was more in touch with the British people on key issues.